A Soyuz ST-B rocket fired into a mostly cloudy sky at 6:37 p.m. local time in French Guiana (2137 GMT; 4:37 p.m. EST), sending the six refrigerator-sized north from the European-run spaceport with a push from 32 engine nozzles generating more than 900,000 pounds of thrust. In less than 10 minutes, the Soyuz ST-B rocket’s first stage boosters, second stage and third stage fired in succession to propel the satellites out of the atmosphere. A Fregat upper stage took over for a pair of burns to place the spacecraft into orbit. The Russian-made rocket aimed to deliver the six spacecraft, built by an industrial consortium named OneWeb Satellites formed by Airbus Defense and Space and OneWeb, to a polar orbit roughly 600 miles (1,000 kilometers) above Earth, tilted 87.77 degrees to the equator. 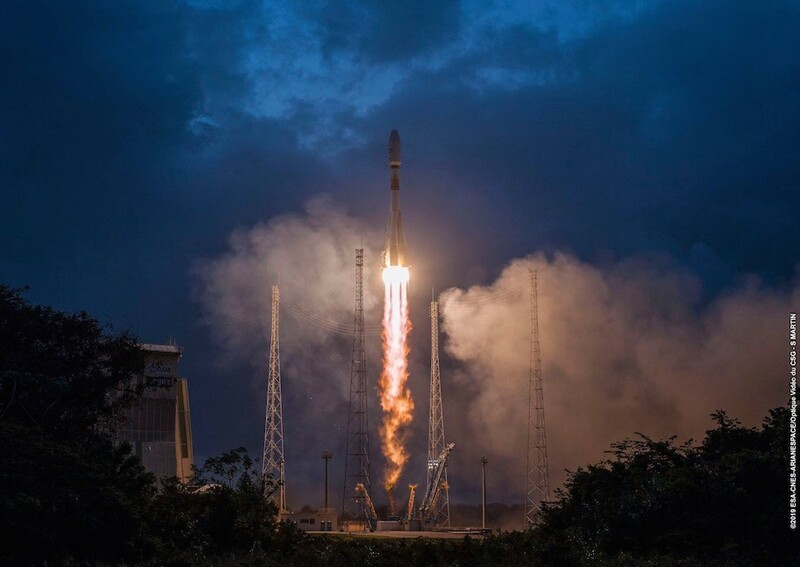 Arianespace, the French launch services provider responsible for Soyuz flights from French Guiana, declared success on the mission after telemetry data relayed from the rocket indicated all six of the 325-pound (147.7-kilogram) spacecraft separated in the targeted orbit. The satellites launched Wednesday will help OneWeb secure the Ku-band radio spectrum the network will use for global broadband services. OneWeb has a Nov. 29 deadline imposed by the International Telecommunications Union to begin operating in the spectrum. They are also pathfinders for OneWeb’s planned “mega-constellation,” and engineers will wring out every system on the spacecraft. Built in an assembly line fashion, they carry plasma thrusters and miniaturized high-power transmitters, antennas and other equipment necessary to broadcast Ku-band signals to support OneWeb’s global network. If the satellites all work as expected, OneWeb aims to begin a regular cadence of Soyuz launches later this year from launch pads in French Guiana, Russia and Kazakhstan carrying between 32 and 36 satellites at a time. That will allow OneWeb to have an initial constellation of 648 satellites in orbit, 600 of which are necessary to provide global coverage. OneWeb has a contract for 21 Soyuz missions with Arianespace, and the companies announced after Wednesday’s launch that OneWeb satellites will also ride on the inaugural flight of the new European Ariane 6 rocket in 2020. Virgin Orbit and Blue Origin also have agreements to launch OneWeb satellites. Wyler hopes the OneWeb mega-constellation will eventually contain thousands of spacecraft, but that dream will have to wait for a second generation of satellites. For now, OneWeb is focused on execution. Spaceflight Now members can read a transcript of our full interview with Greg Wyler. Become a member today and support our coverage. With major offices in the United Kingdom and the United States, OneWeb is at the vanguard of several companies developing mega-constellations of hundreds or thousands or small satellites for broadband Internet access. SpaceX, Telesat and LeoSat are among the other companies working on similar projects, SpaceX launched its first two Starlink demo satellites last year, and Telesat also launched its first low Earth orbit broadband satellite for testing in January 2018. A launch readiness review at the Guiana Space Center on Tuesday cleared the mission to proceed with the flight. Officials pushed back the flight one day to allow time for additional data analysis after a Soyuz launch last week from Kazakhstan encountered an underperformance condition on its upper stage, a shortfall Russian media attributed to the a misstep in filling the launcher with insufficient oxidizer. Russian teams in French Guiana pressed ahead with rollout of the Soyuz booster Saturday from its hangar — known by the Russian acronym MIK — to the launch pad. 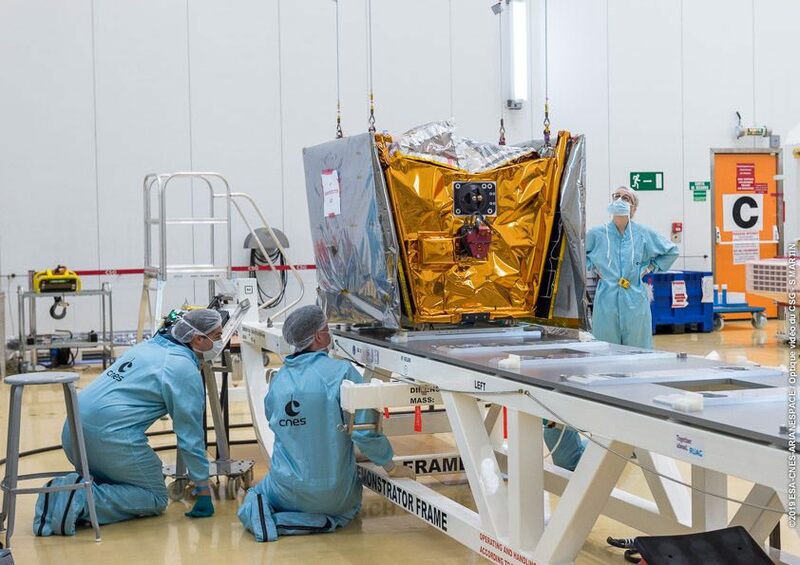 The OneWeb satellites and their Fregat upper stage, already encapsulated inside the Soyuz payload shroud, arrived at the pad Saturday night for mating to the rocket. Wednesday’s launch was also a test for a specially-designed dispenser built for the OneWeb missions by Ruag Space in Sweden. 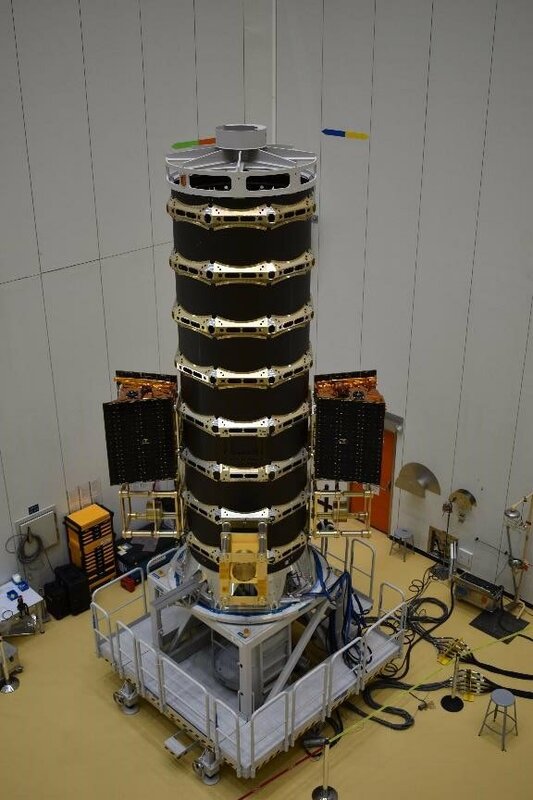 The satellite carrier can accommodate more than 30 OneWeb spacecraft on a single launch, with the ability to release four payloads at a time in a staggered sequence. The first pair of OneWeb satellites were timed to deploy from the Soyuz dispenser around 63 minutes after Wednesday’s liftoff at 2240 GMT (5:40 p.m. EST). The other four OneWeb spacecraft were expected to release from the carrier module at 2259 GMT (5:59 p.m. EST). It took a few extra minutes for ground controllers to confirm a good separation of the final four OneWeb satellites Wednesday, as officials waited for the rocket to pass back in range of a tracking station. After flying away from the Fregat upper stage, each OneWeb satellite was expected to radio its status to operators on the ground, unfurl their solar panels, then stabilize themselves to charge their batteries. The Fregat upper stage, with the Ruag-built dispenser still attached, was scheduled to continue trials in orbit for several hours, mimicking the maneuvers the rocket will conduct on later OneWeb launches with a full load of satellites. The Fregat engine was expected to reignited late Wednesday for a deorbit burn to steer the spent rocket back into Earth’s atmosphere for a destructive re-entry. Wyler has corralled blue-chip companies to invest in his dream to beam affordable broadband Internet signals around the world, a mission he sees as a prerequisite to providing billions of unconnected, underserved people with the tools necessary to succeed in a modern marketplace of goods, services and information. OneWeb’s investors include Airbus, Coca-Cola, Virgin Group, Qualcomm SoftBank, and Intelsat. Under Wyler’s leadership, OneWeb has raised more than $2 billion to pay for the first series of satellites, their launches, and a new factory at Exploration Park, located just outside the gates of NASA’s Kennedy Space Center in Florida. New Delhi-based Bharti Enterprises, Hughes Network Systems — a subsidiary of EchoStar Corp. — and Totalplay, a company owned by Mexican billionaire Ricardo Salinas Pliego, are also behind OneWeb. OneWeb says it needs at least 600 satellites for global broadband service, but the company plans up to 900 satellites in the first generation network. Wyler said a successful launch of the first six satellites will help the company secure the additional financing needed to pay for the entire project. “We’ve had a tremendously positive response from investors, as they’ve seen OneWeb come into reality,” Wyler said. “When you scratch the surface and you start to dive deep through our systems, you realize we’ve built the supply chain, we have the spectrum in place, we’ve got the launch licenses, the approvals, we’re building an incredibly safe constellation so we’ll ensure there’s no space debris. Wyler is a serial entrepreneur whose vision led to the creation of O3b Networks, which provides broadband services to a more narrow swath of the world. He also has a passion for using communications to improve the lives of the world’s poor, and spent three years developing Internet infrastructure to connect schools in rural Africa. 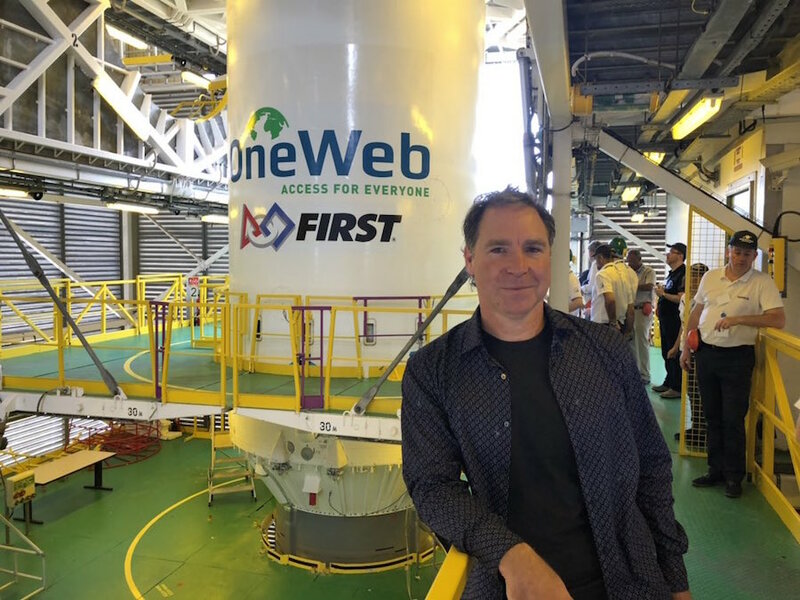 OneWeb is his latest, and most ambitious, project. Wyler’s company plans to deploy hundreds of satellites to blanket the world in broadband, enabling anyone at any location on Earth reliable access to the Internet. “I don’t think we really understand what we did today,” said Adrian Steckel, OneWeb’s CEO. “I think that the amount of useful space to be monetized, to change the use cases, it’s tremendous, and we don’t really know everything that we can do. 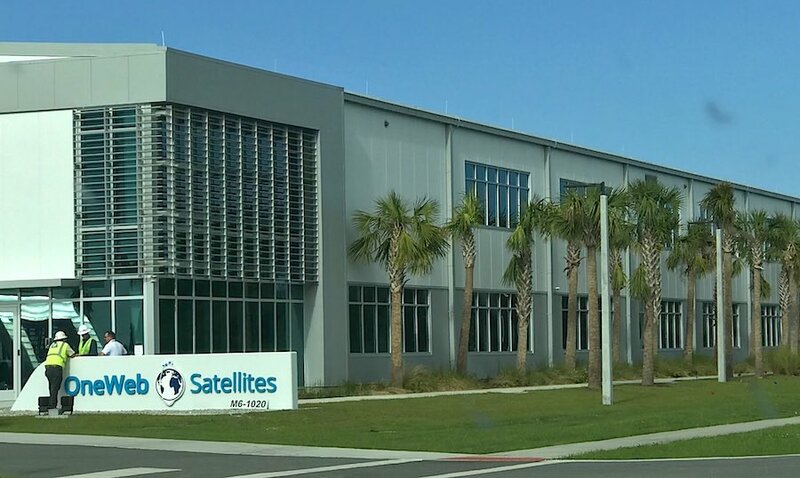 Assuming good performance from the first six satellites, OneWeb will soon transition its production from Airbus’s factory in Toulouse, France, to the new factory in Florida with a footprint covering more than 100,000 square feet (9,300 square meters). Officials originally planned to launch 10 pilot satellites on the first Soyuz launch, but OneWeb recently decided to fly six, and keep the other four on the ground as spares. If something goes wrong with the satellites launched Wednesday, OneWeb will have the other four satellites ready to fly, ensuring the company meets the Nov. 29 regulatory deadline to use its allotted radio spectrum. “We must launch and operate our satellites in order to bring our spectrum into use, in order to maintain our global priority rights to the spectrum for the system we’ve been designing since 2012. So if there is an issue, we have the other four in standby,” he said. The first full-scale launch with OneWeb satellites is planned for August or September, again on a Soyuz, from the Baikonur Cosmodrome in Kazakhstan, Wyler said. At that launch rate, more than 600 OneWeb satellites, which the company says will cost less than $1 million a piece, could be in orbit by the end of 2020, Wyler said. That’s a best-case scenario, assuming the satellites and rockets can be built and launched efficiently.